Imagine you’re in a tight situation where you want to increase the width of your shed, even by a few millimetres. What is the best choice for you? Do you bulldoze your entire shed or add a little extra to the structure? With the Registered Builders at Aussie Made on your side, you can sit back and relax throughout this entire process. We specialise in creating the custom-made sheds Melbourne and Victoria have relied on for more than a decade. Whether you want a brand-new custom made shed or you want to increase the space of your old shed, we have the expertise, designs, and machinery to get the job done. Our personalised custom-made sheds in Melbourne take into account environmental factors, weather conditions, and your design preferences to deliver a stable, sturdy and complete solution. It’s the easiest and most effective way to design your own shed! Whether you love the colour of your home or you have specific needs for large, industrial sheds, you can create the custom-made sheds Melbourne loves through Aussie Made. Ask us about custom made sheds in Melbourne that add value to your home through aesthetically pleasing design. Alternatively, talk to us about the custom-made sheds you need at your outdoor learning area, factory, office, storage complex, or car wash.
And custom-made garden sheds in Melbourne! At Aussie Made, we offer comprehensive options when it comes to custom shed designs. Our wide range of features will ensure that your custom made shed in Melbourne looks great and functions effectively. In fact, all our custom-made sheds are Safe Shed Accredited for your peace of mind. You can customise your shed designs to choose the gutters, roofing and sheeting that suit your aesthetic and practical needs. We also offer a range of windows for our shed designs, including barn style, security screen, skylights, and standard windows. You can make your shed designs as open and large or small and compact as you need, with plenty of options for partition walls and staircases. So, whether it’s farm sheds or custom-made garden sheds in Melbourne, you can create a design that meets your needs. 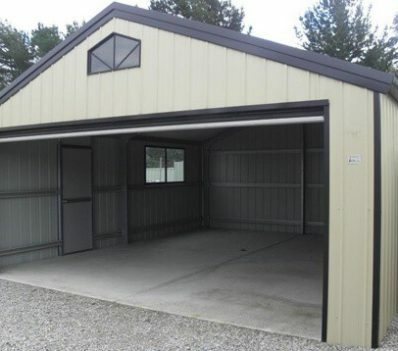 Our custom sheds for sale are sure to meet your needs when it comes to price. While they are crafted from the best materials, our custom sheds for sale will also meet your budget. Even if you choose extra options, like remote access for your doors, we will work with you to ensure that you receive an affordable shed that lives up to Australian building standards. Speaking of Australian Standards, Aussie Made are the shed manufacturers Melbourne can rely on for a safe custom shed that’s completely up to code. Building a shed is not an easy task, and our Registered Builders follow safe work practices to ensure a job well done. Equally, all our custom-made sheds in Melbourne are designed and built with your safety in mind. Whether it’s for families and children or farmers, equipment, and stock, our shed manufacturers in Melbourne will consider all these factors. We pride ourselves on fulfilling the specific requirements of our customers, which is why we can offer complete shed designs for domestic, commercial and industrial customers. 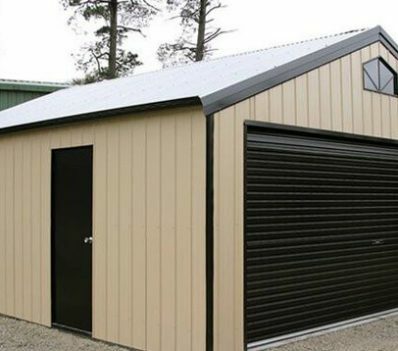 Talk to the shed manufacturers Melbourne relies on for economical, safe, and complete custom-made sheds. Contact Aussie Made on (03) 9739 6999 to chat with us about our capabilities or request a free quote today.